Metals and mineral resources are key raw materials in many industrial sectors, such as construction, energy, and transportation. Although recovery of many metals in being done through recycling, this still doesn’t meet the demand so extraction of primary resources is needed. The impact model is addressing the future amount of average extra ore to be mined and consequent effects on the Area of protection ‘Resources’ caused by mineral resource consumption. An average approach is used to calculate the characterization factors. By calculating on basis of cumulative grade-tonnage relationships the increase in ore amount for all future mineral extraction and then dividing it by the future mineral extraction, average CFs are derived. These CFs are used to assess the potential impacts of mineral resource extraction worldwide. 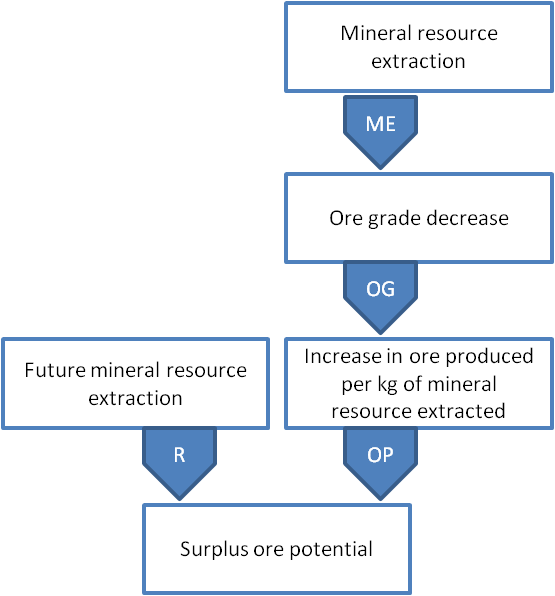 where OPx is the ore produced per amount of mineral resource x extracted (kgore/kgx), MMEx (kgore/kgx) is the maximum amount to be extracted of that mineral, and CMEx is the cumulative amount of mineral x currently extracted.